1 of 5 Drain pineapple, reserving juice. Set chunks aside. In a small bowl, combine drained pineapple juice, ketchup, crystallized ginger, garlic, jalapeno, salt, vinegar and teriyaki sauce; stir to mix thoroughly. 2 of 5 Cut chicken into 32 equal-size pieces. Place in a plastic resealable bag; add pineapple juice mixture. Seal and shake to combine. Refrigerate at least 6 hours or overnight. 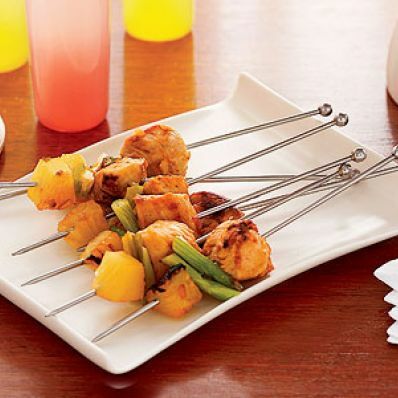 3 of 5 Use small skewers; if they are wooden, soak in a bowl of cold water for at least 30 minutes. Drain chicken, reserving marinade. Place drained marinade in a nonstick saucepan; cook over high heat until reduced to a thick glaze, about 10 minutes. Let cool. 4 of 5 Place 1 chicken piece, 2 scallion pieces and a pineapple chunk on end of each skewer. Brush with a little of the glaze; repeat, using remaining ingredients. Can be assembled several hours ahead, covered with plastic wrap and refrigerated. 5 of 5 Heat broiler. Coat broiler pan with nonstick cooking spray. Place skewers on prepared pan, brush again and broil for 4 minutes, turn, brush with remaining glaze and broil 5 more minutes or until lightly browned. Serve warm or at room temperature. Per Serving: 0 g fiber, 2 g Fat, total, 4 g carb., 1 g sat. fat, 10 mg chol., 90 mg sodium, 4 g pro., 37 kcal cal.